If you need to apply for social security benefits, the process may seem deceptively easy at first. You have the option of calling your local Social Security Office to set up an appointment, visiting the office without an appointment, or simply filling out an application online. Each of these methods has its problems, however, especially if you are not well-versed in social security regulations. The statistics are not very encouraging; studies estimate that at least 70% of all applicants for social security disability benefits are initially denied. The services of an Indianapolis social security lawyer can help tip the scales in your favor. Online applications: The problem with this method is that rules about social security benefits are changing all the time. Online information about eligibility and payments may be out of date. It is best to speak to a professional, like an Indianapolis SSDI attorney, for current information. Walk-in visits: Visiting any office without making an appointment beforehand is always problematic. You may be waiting for hours, if anyone gets around to meeting with you at all. Office appointments: This method offers the most advantages, as it gives you a chance to talk to someone face-to-face. However, employees in his branch of government are often extremely busy. An office employee probably will not give you the individual attention you deserve. Many people are not getting the benefits they are entitled to because of their lack of insight into the social security system. If you are trying to get the kind of benefits you and your family need, the advice of a knowledgeable attorney can be invaluable. 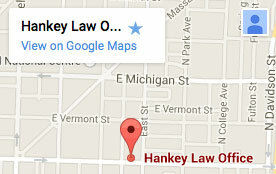 The Indianapolis social security attorneys of the Hankey Law Office have the experience and education to guide you through each step of the initial filing process. Contact our offices at (317) 634-8565.